McBride’s customers enjoy the ice station where they can help themselves to free bags of ice.? The ice station is located in the amenities area under covered canopies. The station includes two large ice machines, along with two large ice storage boxes where a surplus of ice is available for even the busiest of weekends. The water used for the ice machines is cleaned and purified through a reverse osmosis process that assure customers the highest quality of water their crystal clear purified ice. The ice station saves customers time and money that customers would otherwise have to pay for themselves.? This would eliminate an additional stop to purchase the ice on their way out on their trips. 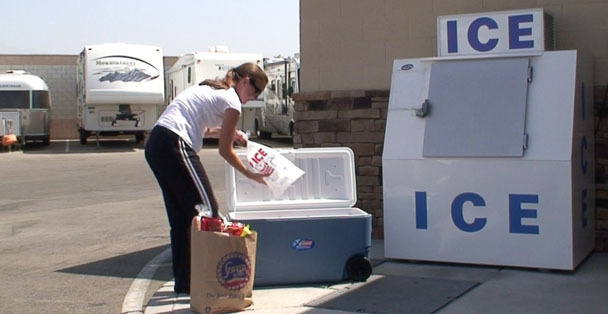 The convenience of having the ice available means you can enjoy more of your time scheduled for traveling and less time preparing your RV. Customers appreciate the free ice and realize the value of having it available, icing down sodas, beer and other perishables in an ice chest or simply taking a bag for the freezer, knowing that the freezer takes time to make ice. The ice station is a real money saver!